Encapsulation is one of the four key benefits of VMware virtual machines. On the surface it may seem like this is a common feature across all virtualization platforms — but it’s not. 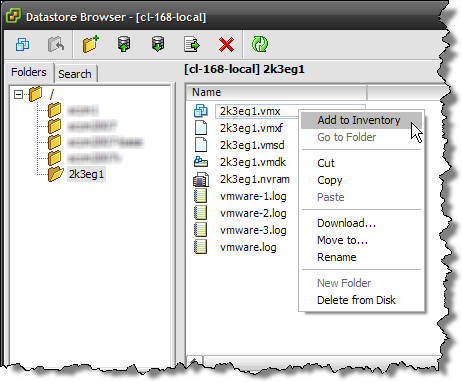 If you are a VMware ESX administrator, you know that a VMware virtual machine consists of several files, normally contained in a single directory. There is a configuration file, virtual disk files, and a few other supporting files. Having all necessary VM files in one directory is the essence of encapsulation. After that you are ready to power on your VMs and get back to work — snapshots and all. Unfortunately, with Hyper-V you need to be more proactive — unless a VM is explicitly “exported” it cannot be “imported.” There is no supported method of importing a VM from a failed host, especially if it has snapshots. Or is that checkpoints? For the curious, there evidently is an unsupported technique to put Humpty Dumpty a Hyper-V VM back together again — for data recovery purposes only. If making symlinks to XML files is your thing, go check it out. When choosing a virtualization platform, don’t forget about the little things that can make a big difference. Always love reading these little tidbits. You should compile them all together into a new site called Hyper-V Annoyances. Shawn, thanks for reading. That’s not a bad idea. At the MCT EMEA Summit in Prague (January this year) Ronald Beekelaar had a “solution” for this as well. I cannot download his presentation yet but I think he’s made something which does the XML symlink thing without having to do this yourself. As the previous commenter noted, it’s another small but very annoying thing about Hyper-V. If you’re coming from Virtual Server 2005 you won’t notice it, but if you’ve got experience with VMware of Xen then you’re looking at this type of thing with disbelief; how could they have forgotten this?